Properties in Miramonti Ski Lift average 4.5 out of 5 stars. Villa Rustichella: an enchanting apartment! 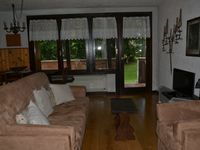 Property 2: Villa Rustichella: an enchanting apartment! Love staying here so much we came back for seconds! We were very happy with our stay in Pierangela&rsquo;s apartment. Apartment is not modern but has everything you need. Having 2 bathrooms is very convenient, saving you time to be ready for skiing in the morning and to be ready for the rest in the evening. They have heat off in condominium from 11pm to 6am. But we have never felt cold, apartment is very worm. Pierangela is very helpful and responsive host. She could arrange renting sheets and towels for us and provided WIFI (pretty fast WIFI). Thank you very much! You cannot bit location &ndash; it is just couple minutes walk to Spinale. From there you can reach any other of numerous ski areas in Madonna di Campiglio. We rented ski and boots at Spinale rental office. They have heated lockers where you can leave ski and boots for the nights. It was very convenient not to carry ski and boots to home. Supermarket is 2 blocks away (4 min walk). I would definitely recommend this apartment.